Thanks for the delivery of my USB cable. Product was received super fast and was a third of the price of most other outlets. Great service - keep up the good work! Sega Mega Drive 2 + Genesis 2/3 Composite Video + Audio AV Cable (Retro Gaming Cable) + FREE SHIPPING! Retro gaming cables are here at Cable Chick! Need a relacement Stereo AV cable for your Sega Mega Drive 2 or Genesis 3 game console? Well you've come to the right place! This is a replacement AV cable for MK2 Mega Drive or Genesis 3 Consoles (for Composite Video + Stereo Audio). The revised Mega Drive 2 model used a different AV output from the first generation machine, with a much smaller plug design, however it brought the welcome addition of Stereo Audio along with the Composite Video signal (whereas the original Mega Drive only had Mono audio output, and relied on the headphone socket for stereo sound conectivity. If you have a TV with RGN SCART input, consider getting the best picture possible from your 8-bit and 16-bit Sega consoles with our Sega Multi-AV to RGB SCART Cable. Our Retrogaming cables have been specifically designed for the 8-bit and 16-bit video game consoles we grew up with, from companies like Sega, Nintendo and a little later, Sony. These cables have been developed to either serve as quality replacements for the original AV cables which shipped with the game consoles, or offer superior AV output quality so you can enjoy these old consoles like never before! THIS CABLE > Composite Video: The next step up and noticeably better for video and audio, however the results are still not great due to the signal being carried through a single pin, and Sega consoles being notorious for poor quality Composite Video output - but, this is how most of us have experience Sega consoles growing up! This cable works as a replacement cable for what ships with the Mega Drive 2 and Genesis 3 consoles. S-Video: S-Video is supported via the multi-AV output on both the Mega Drive 1 & 2 models, and represents a significant step-up from Composite Video quality, thanks to the signal being carried across multiple pins. If your TV doesn't support RGB SCART input, this will be your best option, but requires a different cable with an S-Vdieo plug. RGB SCART: The SCART connector was an amazing analogue standard used in Europe, and it made it's way over to Australia on some higher end CRT televisions. With full separation of the vidoe and audio signals, you will get the very best picture possible from an RGB SCART connection, which is supported on both the Mega Drive MK1 and MK2 consoles. Although you could convert Composite Video to HDMI for use on a modern screen, a converter will not be able to improve on the poor image quality of the Composite Video standard. So if you have a RGB SCART compatible TV, our Sega Multi-AV 8-Pin DIN Cables can be used with our SCART to HDMI Converter for 720p or 1080p upscaled digital audio and video output, and excellent output quality. The Master System MK1 and Mega Drive MK1 consoles share a Multi-AV output, which is different from the Mega Drive Mk2 and Genesis 3 systems. Mega Drive MK2, and Genesis 2 and 3 modles (from the USA) use the same Mini-DIN AV output, which natively supports Video + Stereo Audio. The Multi-AV port can output Composite Video (this cable), S-Video or RGB SCART video, plus audio. RGB SCART offer the best possible video output for your Sega consoles, if you have a SCART TV. 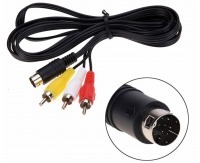 This is a replacement AV cable for MK2 Mega Drive or Genesis 3 Consoles (for Composite Video + Stereo Audio). The revised Mega Drive 2 model used a different AV output from the first generation machine, with a much smaller plug design, however it brought the welcome addition of Stereo Audio along with the Composite Video signal (whereas the original Mega Drive only had Mono audio output, and relied on the headphone socket for stereo sound conectivity. If you have a TV with RGN SCART input, consider getting the best picture possible from your 8-bit and 16-bit Sega consoles with our Sega Multi-AV to RGB SCART Cable. I was very impressed with your speed of service and the quality of the product I ordered which exceeded my high expectations.